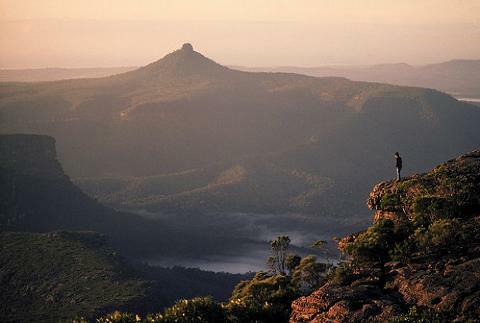 Be amazed by the history surrounding this great walk, the Aboriginal name for the mountain Didthol, meaning Big Mountain, culturally the mountain is a significant area. Later named by Captain Cook in 1770 as Pigeon House Hill for its shape, clearly seen from the ocean. 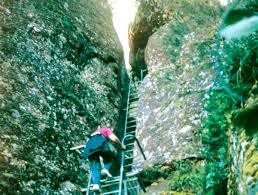 The hike itself is an extremely rewarding experience, the views from the summit to the west into magical wilderness regions of the Buddawangs show sandstone cliffs, gorges and escarpments. Views to the east show the amazing NSW coastline stretching as far as the eye can see. If you choose to add a hotel pickup, please be ready at your designated Hotel waiting area. Travelling north from Batemans Bay in comfortable air conditioned transport you will reach the Morton National Park, catch glimpses of the southern end of the Sydney Sandstone Basin through spotted gum forest and learn about the uses of the area. 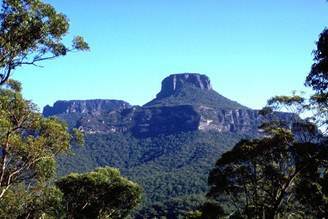 After around an hour drive the dominant Pigeon House mountain awaits at the hike start location. While the hike is considered to be an easy 3 hour return hike, the first section straight out of the carpark is quite steep and walkers should be prepared for a tough first ascent. The first of the rest stops atop a granite outcrop gives great views to the south and is a welcome chance to rest, drink and admire the views while your guides chat about the geology. While the trail continues on a relatively flat plateau through tea tree and xanthoria, pockets of dry and uniquely wet temperate forest pass you on both sides for the next half hour. Finally the mountain gently rises prior to the first of a series of steel ladders and platforms constructed by Natinoal Parks and Wildlife Service. The safe steel structures guide you to the summit where expansive views into the Buddawang Wilderness and the ocean await. Spend as much time as you like on the summit and make your way down the trail, on your return journey lunch is prepared midway with incredible views to help you savour the experience! Upon returning to the car park your guides will take you to the best spots to take a dip or soak your feet to celebrate your hike, either a local beach or the freshwater of the pristine upper Clyde River. It is here that we encourage a natural foot soak, a cold drink and some afternoon snacks. Return transport to Batemans Bay will follow. 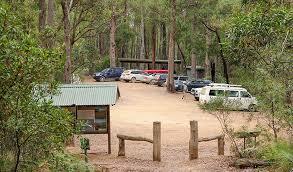 Inclusions - Guides, comfortable transport, morning tea, guided hike, lunch, return to Batemans Bay. 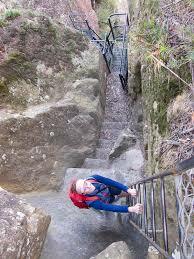 Although short, this is considered to be a challenging hike. Participants with heart, lung, ankle or knee concerns should contact our office to chat about your ability levels. Please note: this tour ordinarily requires a minimum of 4 participants to run. If you wish to book with less than 4 people, please contact Region X to discuss a your options. These may include a private tour, or joining another trip or activity.